1.1 Why Do We Want To Live In The Present? At the end of the day, all we really have is the present moment. We have created this illusion that there is really anything else other than the NOW. All efforts to get us out of the now is where we experience unpleasant states like anxiety, stress, depression, etc. But when we focus more on living in the present. And do things that help us stay there, we regain at sense of happiness. The type we felt when we were children. When we were masters at living in the moment. 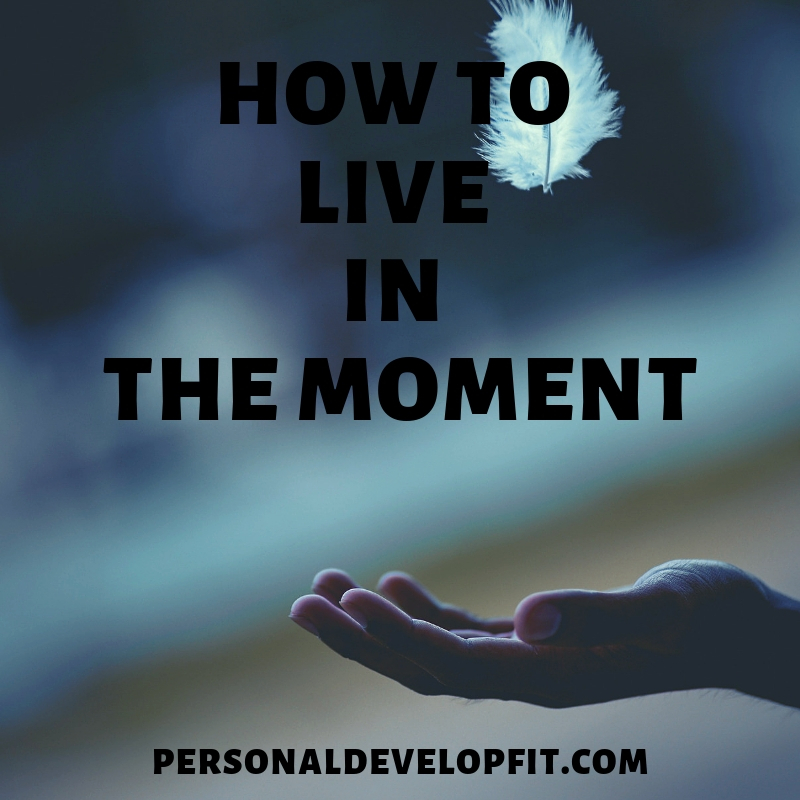 We all have this ability to live in the moment. And because of it, reap the rewards of it. Which are living this life the way it is meant to be lived. Fully present and incredibly blissful because of it. But how do we live in the moment. Life for the moment? Well below I show you the best ways possible to do so. Allowing you to be more present throughout your daily existence. Why Do We Want To Live In The Present? When it comes to how to live in the present moment, I think the first thing to talk about is WHY we want to live there. Well why would you want to live somewhere tropical? Because it is beautiful and it puts us at peace. Both physically and mentally. Well this is the truth about the present moment. It introduces us to something beautiful. The most beautiful. Our TRUE nature. A nature that is pure bliss and joy. That when we feel it, we can transcend time and space. We get lost in the moment, and the past and future melt away. That is the power of living in the present. It is also a beautiful place where no anxiety and stress seem to have life. At all whatsoever. But how do we access this blissful state? How do we stay there for long periods of time? And can it even be done? In short, absolutely. And below I offer you the best tips I know on exactly how to do so. Living in the moment requires that you give more priority to living the in present then you do in the past and in the future. Which is hard for most people. But in order to do this, we need to divorce our stories. We aren’t are pasts. We are simply a collection of experiences that has brought us to this present moment. But we are NOT our past. We don’t have to live there. Thinking about it over and over won’t bring it back. And in order to live in the moment, you need to let go of the past. But that is only half of the process. You need to have faith the the future will be OK. Faith in yourself, faith in a higher energy call it what you want to call it. But faith is needed to not put any emphasis on the future. Simply knowing that the future will be OK regardless of what is going to happen. Even if it doesn’t turn out the way you want it. You need to resolve to know that things are going to work out for you the way the should. In order to create soul growth for you. So in order to truly live in the moment, we need to get rid of our attachment to living in the past. But HOW do we do this? We need to create goals and dreams that pull us towards the future. That drag our awareness forward. Instead of having a better past then our future looks. When the past looks better than our future, then of course we are going to look back. This is just natural. So the first thing I want you to do is to create goals for your life that are captivating. That give you a reason to get up early, even without the help of the alarm clock. Revisit things that gave you life back in your past. Recreate goals in your life that are around things that make you excited for the evolution of those goals. And of who you need to become in order to get those goals. And the reason for this tip being the first. As without a captivating future to look forward to, you will always be looking back at the “the better times.” And I want you to look forward, because I know you have untapped potential my friend. I know that you are bigger than your past. And that you have the ability to transcend the need to look back. And step into the present moment, going after your goals with passion, enthusiasm and a gusto for life. Grabbing life by the horns and steering it whatever direction you choose. So right there, this is a true formula for living in the present. To have a captivating enough future that peaks your interest enough that you no longer look back anymore. And having faith that everything will turn out OK. But how do you have faith, in yourself particularly? Believe it is possible that you can do anything, no matter what anyone says about it in your life. Act as if you already have what you want in your life already in your existence. Take massive actions and engage in daily tasks that bring you towards your goals. These 4 tips can help us believe in ourselves and create bigger vision for ourselves. Giving us fuel for the future, instead of constantly feeling like we are on empty by looking back at the past. Now this can also include letting go of people that hurt you. People that bullied you. People that betrayed you. The more you let go of these type of things, the more you free yourself from the hold the past has on you. Again this is going to be tough. But in order to live in the present moment, again we need to place more priority on doing so. Then holding onto grudges and hurts that have happened to you. Instead use them as a way to strengthen yourself. By letting go of them, you become more free. More lively. More happy. And more powerful. Don’t forgive people for them, forgive them for you. Then developing a better future look forward to can be done. Besides setting captivating and exciting goals, you can also work on developing better friendships and putting better people into your life. This will keep your direction facing forward. But by setting better and exciting goals, this process will happen more naturally. As you will be growing as a person. Which the more you grow the better people you attract into your life. TIP: In order to be truly happy and start moving out of the past and into the present, is to realize that your blueprint for where you should be in life is false. It is set up by expectations that are causing us negative feelings. Tony Robbins talks beautifully about this. Where he talks about how we are not happy because our blueprint, for example for health, doesn’t match where we want to be or thought we would be RIGHT NOW. But in order to be truly happy and be able to live in the present, our blueprint must be inline with our goal of living in the present moment. So detach from your want and need to be somewhere else in your life. You can do this by accepting where you are currently. This will stop resistance to the certain spot you are at. Allow you to feel more positive about it. And move forward with more hope and energy. As well as you will stop beating yourself up. This is crucial if we ever want to live in the moment and be happy. When it comes down to it, when we do things we are passionate about, we concrete ourselves in the present. As close as possible at least. We have fleeting moments of bliss. As again, we are experiencing our true nature. Very minimum when you get yourself out of the past with captivating future goals, you move into excitement. A state of living which has much more energy and hope than that of living in the past. You are trading depression for hope essentially. And each time you are doing things you are passionate about through your goals, you will be moving further and further away from these feelings of depression. Until you no longer live in the past anymore. And the only reason to ever look back is to grow from it. The quickest way I know though, to live in the moment, is to do things you are passionate about. Do them as much as possible. And you will put yourself smack dab, right in the middle of the present moment. Creating a meditation and sticking to it daily can help you be more present. There are so many benefits of meditation. One of the main ones being that it quiets your mind. When your mind is quiet, you can have easy access to the present moment. And a calm mind brings a calm life. Allowing you to enjoy the moment more fully and free from negative feelings of stress and depression. You can start meditating simply by becoming aware of your breath. Or repeating simply mantras like “Om”. The key is to do so on a daily basis. Nothing to intense. Start with 5 to 10 minutes a day. Within a month or so, you will notice that you react more calmly to the things going on around you. The main thing I have learned through the process of learning meditation is to relax before you start meditating. Relax your entire body by doing a scan of all the tension you are holding in your body. Then consciously relax those areas of your body. Doing this quick scan will allow you to reach deeper levels of meditation and calmness. And at a faster rate. You can also walk through nature. Take a stroll through a park or simply through the city. Listen to all the sounds and take in all that is going on. Be mindful of what is coming through all your senses. Feel the wind on your face. The birds singing. The wind blowing through the trees. The horns honking. People talking. This can put you in the present fairly easily. You can also become mindful at anytime throughout the day. At the office. At home. During meals. While dining out. Sitting in traffic. I talk about this a bit below, but keep it simple. Keep it very simple. The more simple your approach is to meditation, the better. The more you will get out of it. It is a simple process, that is meant to be practiced in simple manner. Simplicity = Truth. As humans, we always want to progress and feel a need to progress. No one likes to be stagnant. But the thing about that is when we are unhappy with something happening in our lives, we want to change it. We get caught up in being unhappy or discontent until we make that change. But in order for us to live in the present moment, we need to learn to enjoy and accept the things we want to change. For example, you are unhappy at your current job. Maybe you are going to school to get a better job, but it seems as if it is taking forever. And you hate even going to the present joy because you want to be in the future job NOW. But this can be a great growth opportunity and a way to become more present. In the way that you can simply be happy where you are RIGHT NOW. Choose to be happy that you have a job and that you can pay the bills. If you lost that job and had to be poor or homeless. Then you were able to get that job back, you would be very thankful for it. So anytime you are discontent, remind yourself that you are living for the future more than your desire to live in the moment. And when these moments happen, simply find something at of the situation to be grateful about. Gratitude eliminates a lot of resistance and negative emotion. Use it to center you in the present moment! We all have to drive to work. Or bike to work. Or take the bus to work. No matter what your transportation is to and from work, listen to something peaceful on the way. You can buy meditation tapes or white noise. Or even classical music. All of which can allow you center yourself and access deeper levels of relaxation. It can also help you stay relaxed into the day. Retaining that calm that you created on your way to work. As well as relax you after coming off of a long and stressful day at work. Letting you decompress. And let go of the tension of the day. When we get to attached to who we were in the past, we can’t be present. Be proud of yourself and what you have accomplished. But don’t let it define you. You can transform less if you are living out of accolades from the past. Journaling is very powerful. It can allow you to write out your day. The frustrations, the lows, the highs. And everything in between. You are able to let go of the day and move forward. Letting go of the past so you can live the rest of your day and night in the present. I give myself permission to be fully present in the moment. I feel deep calm and love in the present moment. I am deeply centered in the here and now. Eckhart Tolle talks about the reason why we don’t live in the moment is because we are giving to much priority to the next moment. Always putting more value and awareness on what is next. But in order to live in the moment, we need to simply see it as more valuable than the next moment. Each moment is valuable. See it as this and you won’t be tempted to always want to be living in the next moment. Worry is simply a way of your mind to stay active when you are in anticipation about something. It is a way for us to feel productive. As if we are worrying, we are DOING. But living in the present moment really isn’t about doing much of anything. Not in a non-productive way. But in a way that we are in a state of FLOW or ALLOWING. It is trusting that things will work out the way they are supposed to. So when you start worrying, just become aware of the feeling. Don’t let it become you. Just witness it as you would someone walking by. When you witness your feelings of worry, you can see them in a non judgmental light. When we see them in this light, often times they will dissipate. Allow yourself to feel it fully. Then let it go like you would let go of something in your hand that you have been holding onto for too long. Realize that worrying will not make the future more certain. Nothing in life is certain or for sure. Just embrace the power of trust. Trust that things will turn out ok. The more you trust in the more you will feel more calm and centered in the moment. You will find that you in fact, can conquer your fears and can recover from almost anything that can come out of what you are fearful about. This can help bring you more peace and contentment about your life and the direction is is heading. Letting you enjoy the moment as you have conquered your fears that are keeping you from living in the moment. If you really need to worry, worry when the event happens. Not before. Use your worry to make you present. Worrying is an intense feeling. But you can feel it intensely and use it to center you. Feel it deeply and experience it. You can turn water to wine in a sense. Use it to your benefit. Not the opposite. You can become very centered in the moment at the gym. It is a complete release as you are exerting physical stress. It is an outlet to where your problems fade away. Your mind and body are to focused on the moment to give attention to the past and future. Of course if you are going through tough times, it can be a perfect way to channel the emotions. Let you process them. Because of the fact that the gym puts you in the moment. It gives you the power to work through emotions. Unlike doing so outside of the gym in the chaotic world. Where there is too much going on, leading you to stuffing emotions and suppressing them. Also, if your gym has classes, this can be great too. So you don’t have to think about your workout. Allow the trainer to guide you though workouts. As well as if your gym has steams and saunas. This can be a great way to sweat out physical and emotional toxins. Putting you in the moment through a session of release. You can also play a sport that you enjoy. Playing a sport, like tennis, forces you to concentrate on the game. This can allow the past and future to fade away. Allowing you to experience the bliss of the present moment. We all have those people in our lives that make us forget about the past and the future. That allow us to be ourselves and enjoy ourselves. To enjoy their company and completely transcend time with them. Make it a point to hang out more with these people. And appreciate that time deeply. Reflect on that time. Then when you are feeling like you are living in the past or future too much, bring up this feeling. Recreate that feeling in these moments. You can do this. This will allow you to feel the same feeling you felt with your loved ones. Allowing you to relax more and center yourself in the moment. You can react the way you are “supposed” to react to situations. Or you can choose to react entirely differently. In a way that supports your emotional well being. And your ability to stay in the moment. Bad things happen in life. But is our reaction to them that pushes us into a state of anxiety and stress. When tough times happen, just remind yourself that “this too shall pass”. Remind yourself that you have gotten though tough times before. And that you will come out stronger because of them. Also, don’t go through tough times, GROW through tough times. We can’t learn the lessons of adversity by denying them. Be fully present in your struggles. As hard as that may be. Live in them. Allow them the break you down so you can be built up stronger and better. By doing this and not letting stressful states take you over, you can remain in the present. You will also be able to operate better during tough times as you are dealing with the moment without denial. Helping you solve problems faster. Be a rock for people that need you. And live in the moment while doing so. See life in this perspective. See life as the universe trying to help you. Push you towards your destiny. It gets us out of victim mode as well. And creates a more positive outlook on life. Giving us a strong sense of hope. And trust. The mind wants us to survive. Not thrive. So it wants to make things complicated that don’t need to be complicated. It thinks that if we are living in the moment, we won’t be as safe as we would be if were were thinking about other things. But when trying to live more in the present, don’t complicate this process. It is simple. And answers and truth lies in simplicity. Not in complexity. Again, we were masters at living in the present as children. You have the ability to do so with ease. Just don’t over-complicate the process. Also do things that harness your creativity. This can allow you to put yourself in the present moment through concentrating on creation. Drawing, writing, making poems, raps, music. Things that support your present moment living. Music has a way of centering us and allowing us to transcend pain in a way as Bob Marley so eloquently put it in his lyrics. And because of this reason it has the ability to let us forget about pains. Both physical and mental. Life can be tough. We can pick up and experience a lot of pain along the way. This is inevitable. But in order to cope with these pains, we need a vice. Not multitasking when listening to the music. Make it a point to uni-task. Put all distractions aside when listening to music. Don’t work and listen. Just listen. Have a conversation with the composer. Act as if they are speaking directly to you and wrote it as a letter to you and for you. Start with small doses. Don’t start with an hour long symphony. Allow yourself to deeply feel the emotions of the song. Some great artists that we can listen to to put ourselves in the moment with are some of the greats like Bach, Beethoven, Mozart, Ravel. Anyone who bears their soul to the listener. Anything that is deep enough to resonate with. I know most all music has its place. But most of the stuff out now will not suffice. Find something that speaks to your soul. And even put the same song on repeat in order to experience the present moment. For some reason coffee shops have an element to them to where you can experiences it with all senses. You can see the people smiling, laughing, sad, happy, patient or impatient. You can feel the air conditioning or lack thereof and the hot coffee or cold drink in your mouth and throat. As well as feel your feet on the ground and body against the seat. You can hear the steam coming off the metal cups. The coffee pouring. The people enjoying the coffee with a refreshing “ahhh”. And of course you can smell the aromas of the coffees and teas. Maybe the smells of nearby restaurants as well. Coffee shops are the perfect place to practice being mindful. Allowing you to use all your senses at once. Truly a meditative experience. When we look at something, we see it. But there is so much more to be seen. Take something super simple, like a leaf. Look at it intensely and deeply. Look at the different colors. The broken or cracked sides. The veins running through it. The step and how it widens and narrows. Study the heck out of it. This will put you in the moment. You can do this with anything too. Notice the fine details. It is like watching a movie for the second time. You notice new things. And it can help you become present, wherever you are. This may be the best motivator of all to spring us into action. Realizing and coming to peace with this fact can allow you to do things you never thought possible. It creates a sense of dire urgency. That you don’t know how much time you have left. That the future is not promised. That you don’t want to get to the end of your life always looking forward to the next moment. So resolve to make living in the present a massively big priority in your daily existence. Because you never know when your last moment will be. Enjoy life. Live life. So that you have no regrets when the angel of death comes to take you to the other side. Happiness transcends all suffering momentarily. Remember to smile and laugh. When we take life too seriously we tighten up our face and facial musculature. It makes us tense up as well. And it reflects our mood and influences our mood. It makes us not value life as much as we should. Simply smiling and laughing a bit will lighten up life for you. And put you in a less stressful state. And allow you to experience the moment. And enjoy the moment more fully. Most all pain and suffering come from the thoughts that we think. The thing about it is that we have dominion over our own thoughts and minds. It may not seem like it, but we can let these thoughts go. For the sole purpose that they weigh heavy on us. That we are dragging around these mini anchors that are weight us down and no allowing us to experience happiness fully. The more we let go of limiting thoughts and negative feelings, the happier we get. And pure happiness, at it’s essence is a reflection of living purely from moment to moment. True enlightenment. When you are letting go of your thoughts, act as if they are incredibly heavy. As if you can barely hold onto them, because they are so heavy. This little exercise will help you let go of your thoughts easier. Each time you let go of thoughts, you experience your true nature. Which is always wanting and urging us to live in the moment. Where life truly takes place. And since you have created them, you can let them go. You are the master of your own fate. And your fate is created through your thoughts. If you are having trouble letting go of thoughts, simply see them as not as you. That they are just energy that you have created. Seem them as not being good or bad, they just ARE. Once we identify with our thoughts, we are transported through time with them. For example if we think about how much we cant stand someone who wronged us, we get carried away with that feeling. And then that takes you to other thoughts and scenarios that are attached to the person you despise. Then a couple seconds or minutes later you are centered back into the now. But wasted precious time. But if you don’t react to thoughts, simply just allow them to be there and pass, you don’t go down this nasty spiral. This may seem a little strange. But this tip can help you stop wanting to be in the next moment. If there is no future, you have to embrace the now. Simple tip, but powerful. Give it a go.